"A FEW MUSINGS ON FRANK BROYLES AND GEORGIA TECH Part Three"
Georgia Tech left the Southeastern Conference in 1964 and longtime Head Coach Bobby Dodd left Georgia Tech’s sideline in 1966. While Tech struggled to recapture the glory of Dodd’s greatest teams in the years following his departure, the three consecutive 4 – 6 seasons compiled by new head coach Leon “Bud” Carson were ultimately perceived and remembered by many followers as “horrible” years. 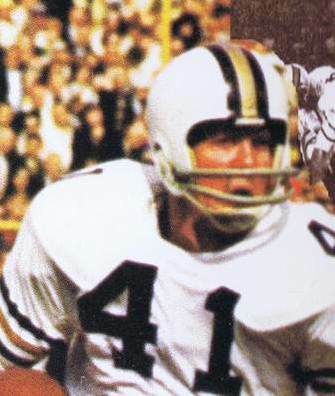 As an Independent in ’65, Dodd turned out one of his typically good 7 – 3 – 1 squads that defeated Texas Tech in the Gator Bowl and completed his final, 1966 season with a fine 9 – 1 record. In his last game as head coach, the Yellow Jackets dropped a 27 -12 decision to Florida in the Orange Bowl, yet it was correctly noted and fondly recalled as another Dodd appearance in a major bowl contest. Enter new Georgia Tech head coach Bud Carson who certainly had a different approach to the way in which he prepared his teams for success relative to Dodd. Carson had been a multi-sport star at Freeport High School in western Pennsylvania, a quarterback who was a three year letter winner as a defensive back at the University of North Carolina who then enlisted in the U.S. Marine Corps. After his military duty he returned to Freeport to teach and coach before taking his first head coaching position at nearby Scottsdale High School. Two years later with a 16 – 2 - 1 record, he became frosh team coach and a varsity assistant at his college alma mater, serving both Jim Tatum and Jim Hickey in a variety of capacities during their tenures at North Carolina. He was named as “head of the defense” at South Carolina and after a year, was hired by Dodd as his defensive coordinator, taking the place of former Tech linebacker Jim Carlen who had become the head coach at West Virginia. Carson’s 1966 version of “The Tech Wrecker Defense” that gave up a touchdown or less in six of their games brought quite a bit of national attention. There was pride in the Tech tradition of promoting one of their own assistants to become head football coach and Carson seemed like the natural candidate to succeed Coach Dodd although other assistants had been on staff longer. 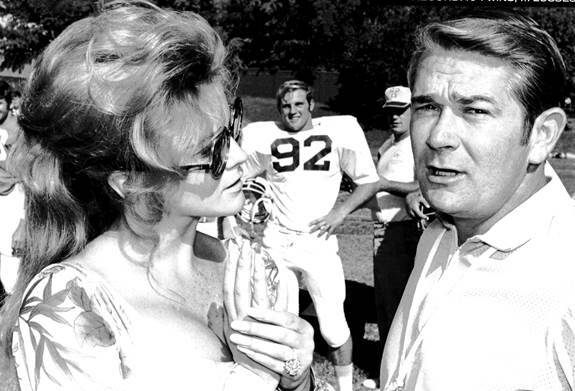 Actress Ann Margret visited Coach Carson and the Yellow Jackets while filming a movie in Atlanta with Joe Namath. Many considered this the true highlight of the 1970 season! There was some grumbling as Carson tacked together three consecutive 4 – 6 seasons with less defensive effectiveness than the ’66 team had demonstrated but later, Dodd commented that Carson took over when “our material was at a low ebb…things were not encouraging at all. My freshman teams had won only one of its last nine games. With our academic standards it was tougher and tougher to recruit. That was one of the reasons I decided to retire.” Realistically, few steeped in the habit of success established by Dodd would have been satisfied with anything less than a run of one or two loss seasons, one of the afflictions of being “the man that follows the man.” Carson however was more than anxious to have a head coaching job and Tech was one of the better ones in the nation so he was not going to walk away from the offer. If the immediate response of the fans was “He ain’t no coaching genius like Dodd,” then the immediate response of the players may have been “so this is what hell-bent-for-leather football is all about” as the level and frequency of hard physical contact was multiplied many times over what Dodd had established. When camp opened, it seemed as if full contact scrimmages were the order of the day, every day. The quarterback who led Dodd’s last teams, Kim King, was later inducted into the Georgia Tech and State of Georgia Sports Halls of Fame and is considered to be one of the Yellow Jackets all-time great players. He stated that “Coach Dodd was supportive; he rarely fussed, hollered, or got on players. Bud was more a Marine drill sergeant; he’d get on guys, rarely being supportive. All of a sudden, overnight, we were cast into this boot camp mentality where players were fussed at more and made to practice more. The practices were more physical. Not many players adapted very well, especially the seniors.” Carson’s first season featured an injured King who still graduated as Tech’s career passing leader, Lenny Snow who set a number of rushing records, John Sias’ record-setting season and career reception marks, and a losing record! Defensive woes dominated Tech performances despite the efforts of linebacker Eric Wilcox who set a team record with twenty-eight tackles against Georgia in 1967. 1968 offered more of the same with Sias hauling in sixty-one passes for 902 yards, another losing record, and a defense that surrendered a record thirty-six touchdowns. 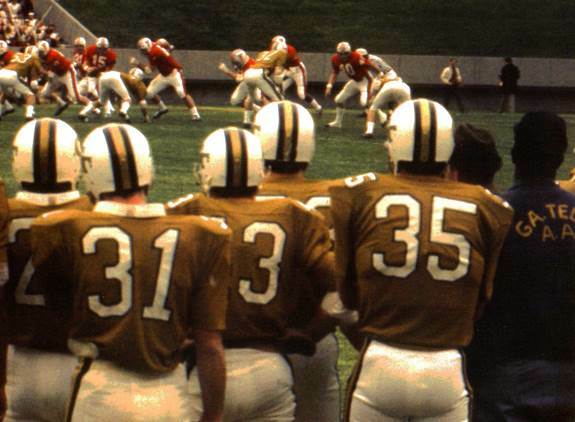 The 4 – 6 seasons of ’68 and ‘69 were described by one reporter as, “…wide-open football. Both ways. The defenders gave up a record 36 touchdowns, and Duke hit them with 36 first downs. The secondary was kept busy, and linebacker Buck Shiver was credited with 133 tackles.” Fans were frustrated that Carson’s defensive teams were neither consistent nor particularly good while he was head coach, an unexpected turn of events considering his previous success as a defensive coordinator. Most Tech followers will happily recall improvement on the defensive side of the ball in 1969 with the arrival of nose guard Renso “Rock” Perdoni. The exceptionally quick and strong 245 pound grinder was generously listed at 5’11” and had led the Ferrum (VA) Junior College team to the National Championship. He could have qualified as a “one man gang” at Tech but the win-loss balance played like a broken record with yet a third consecutive 4 – 6 season. Perdoni played his final season attracting national attention and was one of four finalists for the first Rotary Vince Lombardi Award presented to the nation’s best lineman or linebacker. With quarterback Jack Williams manning the offense, it was believed that Carson’s 1970 Dodd-like record of 9 – 3, number thirteen national ranking, and 17-9 Sun Bowl victory over Texas Tech had returned the Engineers to the lofty heights they were accustomed to. Unfortunately 1971 brought a return to inconsistent football. 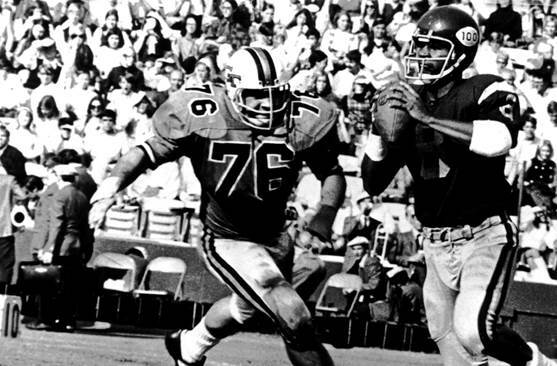 Their 2 – 4 start was overcome by defeating four consecutive “weak sisters” but the 6 – 6 finish, lopsided 41 – 18 loss to Ole Miss in the Peach Bowl, and a significant drop in game attendance more than stifled what had been considered a breakthrough in ’70. There was also what was described as “an avalanche of grumbling” that in part stemmed from Carson’s difficulty in getting along with administrators, boosters, alumni, and some staff members, all leading to his dismissal. Carson of course had great success as the defensive coordinator and architect of the Super Bowl dominating Steel Curtain Defense of the Pittsburgh Steelers. However, as a thirty-five year old first time head coach of a major college program, he made the 1989 admission that "I was no more ready to be a head coach than I was to fly, I made a lot of mistakes." He added that his “biggest mistake was not delegating authority to his assistant coaches.” There was a bit of surprise when Carson left the Steelers after the 1977 season to take the same defensive coordinator position with the Los Angeles Rams but it was done, dependent upon whom one believes, with “the promise” or “the possibility” of eventually becoming the head coach of the Rams. He was the coordinator for the 1979 Rams team that went to the Super Bowl but was fired after the ’81 season. A year with the Colts, another with the Chiefs, a season as a volunteer coach with the University of Kansas, and then he found resurrection of his career with the Jets as their coordinator from 1985 through ’88. Finally, in 1989 Bud Carson was an NFL head coach, gaining the top spot with the Browns but that lasted but two seasons. He surfaced as defensive coordinator with the Eagles for four years and returned to the Rams, this time in St. Louis, in ’97 before retiring. Georgia Tech spent nineteen years as an Independent and never seemed comfortable in the role. They had lost their great rivalries with other SEC teams and had only Georgia as a yearly big game that was circled on the calendar. Georgia in turn now gave as much emphasis to their SEC foes as they did Tech, a necessity in that ultra- competitive conference thus taking some of the luster off of the Bulldogs- Yellow Jackets annual battle. In 1983 Tech affiliated with the Atlantic Coast Conference after posting a 104 – 100 – 5 record as an Independent, not quite the 206 – 110 – 12 mark that carried them through the SEC (with Dodd’s 165 – 64 – 8 overall record contributing most of that success). The facilities also grew to be substandard and needed rebuilding but Tech did return to assume a National Championship in 1990, major bowl game appearances, and a vital place in the ACC.